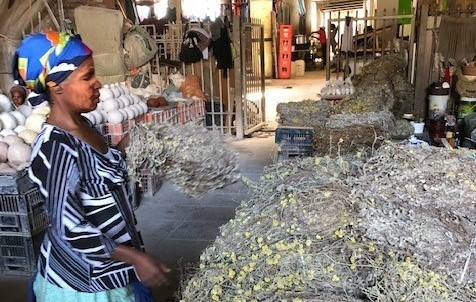 The lime and impepho (herb incense) market in Warwick Junction offers a cool respite from the heat of a Durban summer. 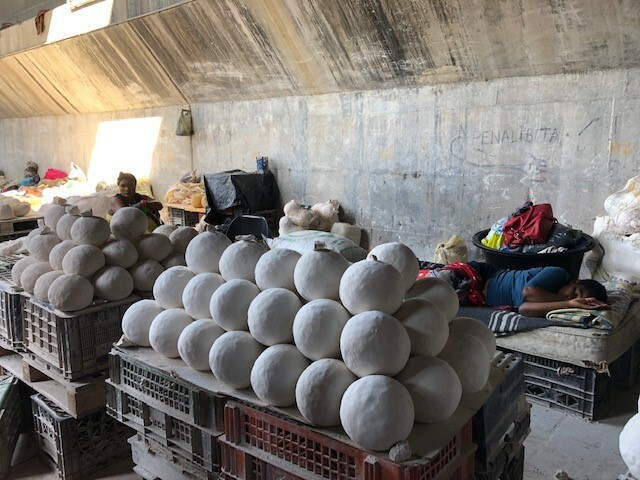 Tables piled high with balls of chalky white lime and bundles of dry herbs line the open space as traders and customers pass by along a walkway through the centre. Sunlight filters in from the Brook Street market area and casts warm light against the walls, where one of the traders catches an afternoon nap as her neighbour watches over her table. The traders keep a constant eye out for customers who may want to buy a ball of lime for or a bundle of incense for R15.00 (around US$1). Lime and impepho are both practical and cultural touchstones in this part of South Africa. Lime is used on the face as a sunscreen, as well as for markings on traditional healers, marking out novice and experienced healers. It’s also used for medicinal purposes with pregnant women, and routinely used in construction. Impepho is burned to connect with ancestors for both prayer and complaint, and plays a central part in Zulu funeral rites. The women alternate working there for two weeks while the others are away mining the lime in Ndwedwe, 20 kilometres away. To get a permit to sell and rent their space, they have to pay R240.00 (around US$17) in full up front for 6 months even though they actually alternate in and out of the space, working there just 2 weeks in a month. The women have self-organized, arranging themselves into four committees: one for each side of the market space, for each two-week period. For ten years now, Asiye eTafuleni has been working with traders in the lime and impepho market at Warwick Junction, most recently through the Kanyenathi project. The project established regular Kanyenathi meetings where traders from the different market areas within Warwick Junction can discuss issues that arise and negotiate their resolution with representatives of the municipality. 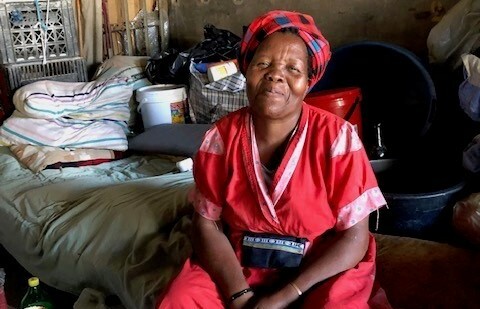 Ma Violet Kwekwede (Ma Violet) is a 65-year old Xhosa woman originally from the Eastern Cape who’s been selling impepho and snuff in the market since 1994 – the year apartheid ended, almost 25 years ago. Ma trades to support her children and grandchildren. She had seven children originally but three of her grown sons have now died, leaving behind their own children and wives for Ma to support. The family harvests the impepho back in the Eastern Cape, over 300 kilometres away from Durban, and Ma’s daughter brings it into Durban to her mother by bus, returning with groceries and household supplies Ma has been collecting as she finds a good deal in Warwick on things like cooking oil and rice. The lime and impepho market was originally gated to make it difficult for people to build squatters shacks in the space, and then the gates were locked two years ago when the city decided to redevelop the bead market area just next door. The women have heard rumours that the gates were locked to keep them safe, but they have been taking care of themselves since the city moved them to this market in 1996, making their own informal security arrangements with the barrow operators who move their goods to and from storage. Meeting after meeting, representatives from the Business Support Unit (BSU) listened to the women outline their complaints. Minutes of the Kanyenathi meeting reflect city promises that they were “going to take care of it” and unlock the gate. As the November Kanyenathi meeting came and went with no action from the city, Ma Violet and her sisters were frustrated and looking for other options to get the city to finally take action. They gathered as a group and marched down to the BSU office to ask for the gate to be unlocked immediately. Initially they marched in a group of 8 women, and then again in a group of 10. Both times, the city officials there met with them and said they were busy but would definitely come and deal with it “soon.” Ma Violet was undeterred – she took the cell phone number for the official and phoned him again to follow up 4-5 more times. Finally, in the middle of January – five months after the issue was initially raised by the women through the Kanyenathi meeting — the BSU official visited the lime and impepho market to meet with the women. He promised once again that the city would take down the welding on the gate and agreed with Ma Violet that the best option would be to buy a padlock for the gate instead so the women could have one of the keys. “But we knew that if the city has to do this, it would take a long time,” Ma Violet said, referring to the process the city has to go through, getting multiple quotes to purchase anything. At this point the women had already waited for 2 years for the gate to be unlocked. In the process they had lost regular customers and were having to pay barrow operators extra money to bring in their stock and supplies the long way around, via a set of stairs. Some weeks the women were lucky to sell 6 balls of lime, making only R90.00 (around US$6) for the week. 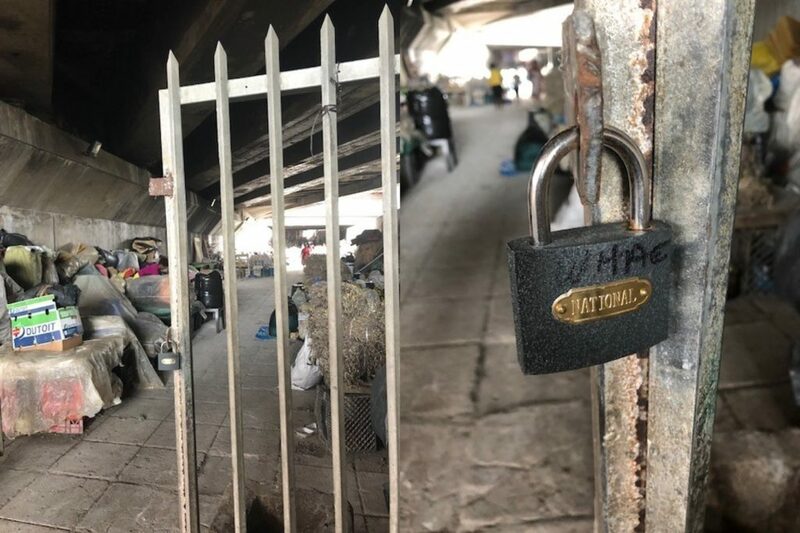 After the city official left them that day, the women immediately took up a collection and every woman in the lime and impepho market paid R1.50 (around US$ 0.10) so that they could buy a heavy padlock with two keys, one to give to the city. They persuaded one of the local welders doing work elsewhere in the market to come break the welding on the gate for them: problem solved. Ma Violet feels satisfied with how the women have worked together to handle their own problem. Read more about the Kanyenathi project here. Rhonda Douglas is a WIEGO representative and wrote this piece whilst visiting AeT in January 2019.